Plastic funnels directly from the manufacturer. If you are looking to buy high quality products in any sort of wholesale quantities then going direct to the UK manufacturer is your best bet. 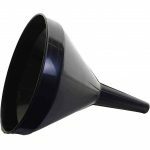 Our range of plastic funnels has a range of domestic and industrial uses – they are as at home in the kitchen as they are in a garage, workshop or on a factory floor. Plastic funnels are particularly popular in the catering sector – and because all of our plastic products are produced from high quality, food-safe polymers they score well for hygiene. They are dishwasher safe and easy to clean. They are also safe for pouring chemicals and pigments.